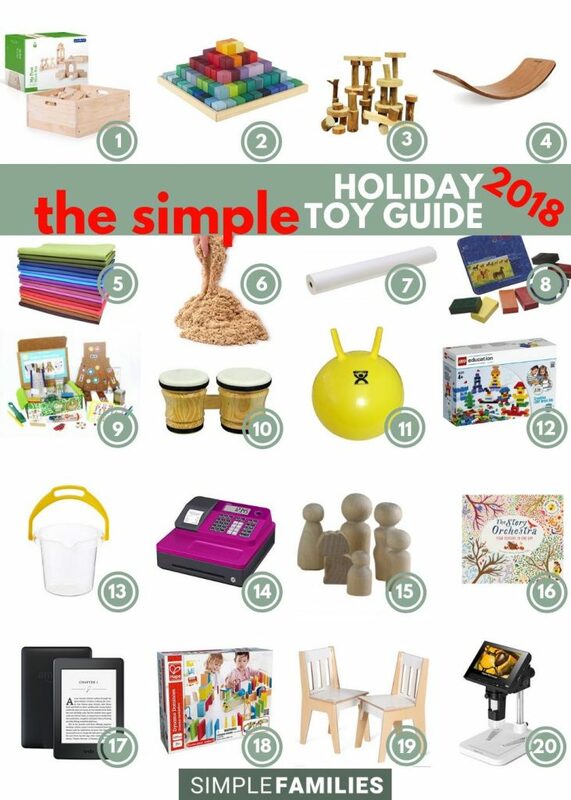 Disclaimer: This isn’t your typical list of the “2018 Top Holiday Toys”–instead it’s the simple + intentional one. There’s nothing like the joy on a child’s face when he’s ripping through a pile of gifts on Christmas morning. Or perhaps it’s a slow and steady rush that comes across during gift-giving on eight nights of Hanukkah. That joy (a.k.a. a gigantic rush of dopamine) isn’t limited to the child–as adults we feel equal levels excitement and giddiness when we see our children light up. Giving and receiving gifts feels good. What doesn’t feel as good is the accumulation of stuff that results around the gift-giving seasons. 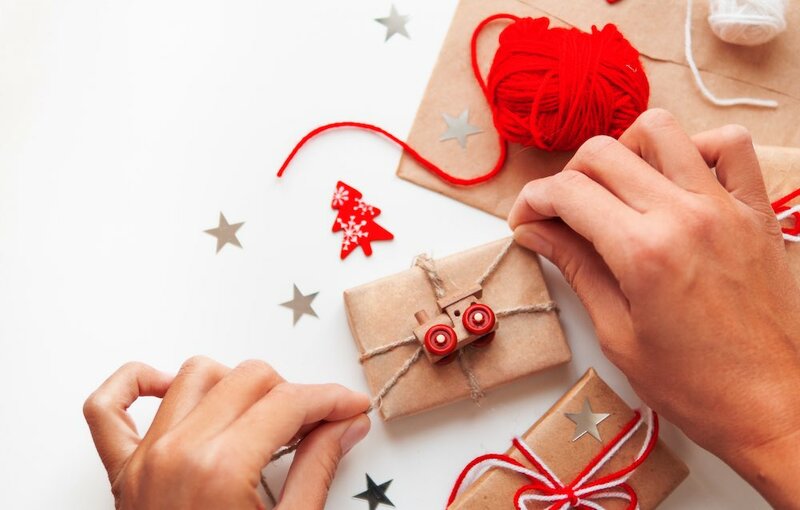 Forbes magazine estimated holiday spending has topped $1 trillion in recent years. Americans alone produce more than 250 million tons of garbage each year. What comes in must eventually go out. When it comes to toys, the statistics are startling. In the toy industry, 90% of toys are made of plastic. Many of those are inexpensively made and short-lived. These unwanted, unused, and broken toys are piling up in landfills across the world. I’m not here to tell you to stop buying your kids toys. Instead, I am encouraging you to start buying toys with intention. Through our buying habits, we are teaching our children. They are learning by watching us. Let’s teach them that childhood is not disposable. To do that, let’s stop buying toys and clothing that are single-use and bound for the landfill. Kids focus and engage better in simplified spaces. Kids play more creatively when they have fewer toys. Let’s start buying our children toys that are built to last. That means toys that are higher quality and will last for several years, but will also hold the interest of children across a variety of ages, interests, and genders. In a perfect world, we would be choosing toys that will be used by multiple children in our own family and then passed on to other families–rather than sent to a landfill. Most “Top Holiday Toy Lists” will give you a list of toys that are “front-loaded.” That means all the joy comes on the frontend, in the early stages. They bring a lot of excitement and joy in the unwrapping and early moments, but children will either lose interest quickly or these toys will not withstand the test of time. When something is back-loaded, it means that the value will increase in the later stages as compared to the earlier stages. Back-loaded toys will bring less excitement upon opening. That’s because these toys require effort, creativity, and innovation. So the real value and joy will come out across a period of years, rather than for 10 minutes upon opening the toy. When we back-load our toy choices, we inadvertently make space for the real gifts of the holiday season: life, love, family, and religion. When your kids open the door to see Grandma and Grandpa arrive for a visit, they won’t be digging through the suitcases looking for gifts. The excitement will be focused on seeing the real gifts: the people standing in front of them. Without further ado, here are 20 back-loaded toys that I think will bring joy and creativity to your family this holiday season (and for years to come). Below, you will find individual developmental benefits of each item. This post contains affiliate links. When you purchase through these links it costs you nothing, but Simple Families receives a small percentage that contributes towards keeping this operation going. Let’s start this list off with the fundamentals. Numbers 1 to 5 (along with #19 the table + chairs) are the nuts and bolts of a simplified playspace. These toys are to a playroom as pots + pans are to a kitchen. They will be used daily to help cook up new creations. Unit blocks don’t look fancy and won’t elicit any squeals of joy, but they will provide countless options for creative play and innovation that can be woven in with other toys. You don’t need to buy a house, a horse barn, or a race track. You can build them out of blocks. Having open-ended toys like this will evoke creativity and avoid the need for buying more toys. As many of you know, I am a huge advocate for outdoor play. When our kids can’t be outside, I love to bring some nature indoors. These blocks add a unique touch to all our children’s creations. They are made from fallen branches and have a lovely feel. With the winter months ahead, there will be a need for indoor-friendly ways of burning off childhood energy. The scooters I posted last year are my absolute favorite option for this, but are limited to hard floors. The wobble board can be used on any floors to hone balance skills and can also be used in conjunction with other block materials. Flip it over and it can be a ramp for cars, a hideout for dolls, or anything else your kiddos can dream up. One of my favorite childhood memories is playing with a lace apron. I used that apron to become a bride with a veil, to be a chef, and to cover up my favorite dolls. Although I am a huge fan of silk scarves, I also encourage you to go to the craft store and buy a variety of pieces of unique fabrics. Gift those pieces of fabric along with some clips and your kids will have an endless wardrobe of dress up opportunities. If you have a gift-giver who likes to give all.the.things, this is a fabulous way to do it. Kinetic sand is a fun, sensory option. This sand lasts for years and is enjoyable for the whole family. It’s a great rainy day activity to pull out–we often try to bury little treasures (i.e. sequins) and the kids will do a treasure hunt. This might be the best gift on this list. We use this roll of paper on our large children’s table (see #19). I roll a piece all the way across and tape it to the edges with masking tape. We have drawn runways for toy airplanes, cityscapes for cars to drive around, and we even draw out diagrams to plan for block structures and train track setups. My kid’s favorite is to roll out a piece on the floor and trace each others bodies. These crayons have a bright, bold color to them. The rectangular shape is great for small children to strengthen hands towards developing a proper grip. They can also be laid on their side to make rubbings of leaves or other things like sandpaper letters. Sometimes I scatter these type of things on the large table and cover it in paper, then my kids color/rub the crayon all over searching out the hidden objects. We’ve had a lot of fun with this subscription box. It provides simple, eco-friendly craft activities for kids of variety of ages. It’s great for Pinterest-averse parents like myself. Boxes like this can be helpful to leave for babysitters or for extended family visitors who like activities that are more structured. Use code get50 for 50% off your first month. We’ve had kits with toy instruments. Sure, they are fun. But they break and sound lousy. Instead, I recommend investing in higher-quality small instruments that make a beautiful sound and will hold the interest of children as they grow. For grandparents who like to buy series of gifts, a new instrument could be added to the collection each year. A few ideas are a real tambourine, a triangle, a ukulele, maracas, and bongos. Who knows, maybe you will feel inspired to learn a new instrument right along with your kids? We use these balls in two different ways. My kids love to grab onto the handles and hop around (which is a great core strengthener by the way–I know personally). But we also use it to sit on in lieu of a regular chair at our kid’s table (#19). This helps wiggly kids to sit for longer periods of time–they can still get their wiggles out while focusing on table activities. Last year we bought our (now almost 5 years old) a set of LEGO Classic. I quickly found that LEGO Classic ain’t so classic. These kits contain a significant amount of highly specialized pieces (which are hard to reuse outside of the specific design ideas provided by the company). These type of pieces make it hard for younger children who are just starting out with LEGO. That’s why we are going to put that set into hiding for the time being and invest in this LEGO Education Set. This education set is reminiscent of the LEGOs of my own childhood–simple pieces that can be used to innovate numerous creations. Hello random toy. After my playroom tour, this was the number one question I received: “Where did you get that clear bucket?” Our clear bucket has been discontinued but this one is a lovely, albeit small, alternative. If anyone encounters a larger clear bucket, send the link my way! A bucket like this can be used as a “shopping basket,” a purse, a hat, or to transport a variety of smaller items. WARNING: This item is not tried and true, but I like the idea of it. My kids enjoy their toy cash register from Ikea, but the drawer barely stays shut and it’s hard to use realistically. That’s why I’ve thought about buying them a real cash register they can use for playing “store.” My kids also love to pretend to have a movie theater and sell tickets. We have a beloved laminator that we use to make real money and tickets. So if you try this cash register, please report back to me. It’s great for early math skills! If you and your children enjoy creative endeavors, then make your own peg dolls. If not (like me), you can find some lovely options on Etsy. We have peg dolls from this store and this store. The above listed options for blocks are great to create homes, castles, and hideouts for these peg dolls. We have had the original Story Orchestra Book for several years–and it has been so-very-well-loved. It’s a story written to the tune of Vivaldi’s the Four Seasons (the book plays actual good quality music while you read). I am a huge fan of illustrator Jessica Courtney-Tickle and her work in this book. My kids are getting her follow up books for the holidays this year: The Story Orchestra: Sleeping Beauty +The Story Orchestra: The Nutcracker (both play their respective Tchaikovsky music). No longer do I carry a giant diaper bag with room for books. Instead, I carry my Kindle reader. Even though it’s just black and white, my children absolutely love to read pictures books on it when we are out and about or traveling. We use Amazon FreeTime which provides us with a library full of books for just a few dollars a month too. Personal Note: I prefer not to read to my kids on a regular tablet, the stimulation the screen provides gets a noticeably different reaction from them than a traditional Kindle–but that could just be my kids! My siblings and I loved Domino Rally as kids. This wooden alternative is fun for the whole family. There are wonderful STEM benefits to this toy, and the set up/creation can involve all the family members. 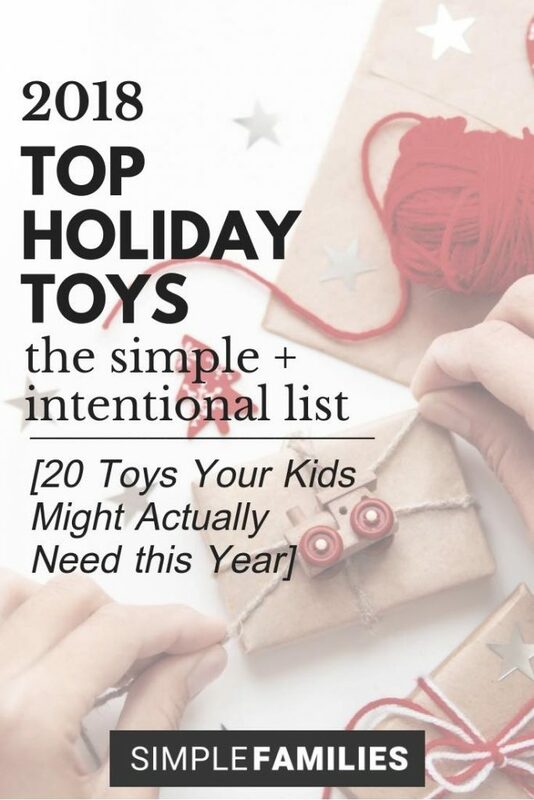 It’s on the top of my list for my kids this year (maybe a little bit selfishly…). As I have mentioned several times above, we love our high-quality table and chair set from Sprout-Kids. Sprout-Kids is an American-made company that focuses on creating great, sustainable products at affordable prices. This table has legs that switch out to grow with your children from ages 8 months to 15+ years. We previously had a 30in x 30in table, but with two children we were limited on the number of projects we could undertake in the space. We have since upgraded to the 30in x 60in table with a white laminate top and are thrilled with it (as you can see it mentioned repeatedly above, we use it with any variety of toys). We have two chairs and two stools (the stools work better for the grown ups and can be slid under the table). A microscope like this will suit even young children that aren’t yet able to focus on a more traditional scope. It also works great if you have multiple children that want to look together. Along with parents, kids can find tiny treasures to examine under the microscope. Anything from food particles to insects–the options are endless. Are you back-loading the toys for your kids this year? I’d love to hear your ideas! GREAT!!! Resource! Love it! Thanks so much! Thanks Carrie, it was a labor of love!! This is fabulous, thank you! I’m really eyeing the grimms pyramid! We’ve had the learning resources cash register for several years now and I would definitely recommend it. It’s held up well (aside from the included paper money). It has had a lot of use! I’ve been contemplating buying the Grimm’s rainbow partly because I want to look at it on our bookshelf! I’m thinking it might be decor in our house long after it’s played with. Such a great list of thoughtful things to include in our children’s lives and our homes. Thank you! Haha yes to the transparent bucket! I use clear bins with an image taped to the side so the kids know what goes in each (trains, play food, etc) and the bins can easily be switched in and out of storage so we don’t have too many things out at a time. But those bins are used as a toy just as much as the contents – and so are our laundry hampers! I clicked over to your playroom tour and now the Usborne “Look Inside” books are on our Christmas Wishlist – my kids love those types of books! We have a couple similar flap Usborne books that I found at Costco this summer and my 7yo pored over them for ages. Love this list! I’ve had some of these on my list for awhile. We are getting my daughter a wooden kitchen and my son a wooden marble run that he has been begging for for over a year now. He’s a little builder and will spend hours with magna tiles or duplos or his train track. So I know it will be well used! I love this concept of back loaded toys! So important as they are the things that will inspire imaginative play for years to come rather than being used once or twice excitedly. Thank you for mentioning the joy of scarves and clips and linking to our playsilks on Amazon! Thanks for reading Sarah! I should say that my kids are also getting your wand/ribbons in their stockings this year too! Love, love, love this list. Thank you!!! The only thing I would consider adding to the list in the future (Though I know it’s not an exhaustive list!) are Magna-Tiles. My 3.5yo loves them, they allow for such open-ended creativity. I am amazed at what he can turn the tiles into (houses, trains, helicopters, whatever). He also likes figuring out what they stick to (the fridge, our metal baby gates, etc). Also as a bonus when we bring them somewhere (like on a plane trip) they all stick together (as magnets do), making it relatively hard to lose individual pieces. Love this Liz! I had magnatiles on the list last year and I wanted to switch it up…but we still absolutely love ours! I can attest to the cash register. I had a very similar one growing up (in my twenties). My child can now play with the same one. I think it just needs new batteries for the screen (adding amounts for sales, very low tech). My siblings and I used it for stores, playing train or airplane, bank…it got used a lot. So many people have messaged me and said this! I love it! This is a phenomenal list. Thank you so much! I’ve been on the lookout for a new table and chairs for our kids as they are outgrowing their current set and it is an integral part of our life. Those sprout-kids ones look awesome. So glad this list was helpful Nikki!